– Jackie is now only on a minimal dose of Methotrexate and has added Bikram yoga to progress her health even further! Clint: Really excited to be chatting with Jackie today. She’s in St. Louis, Missouri. How are you Jackie? Jackie: I’m great Clint, how are you? Clint: Really really good. And there’s just the couple of minutes that we’ve gotten to know each other before we’ve started recording has made me very excited to have you explain the journey that you’ve been through. Because you’ve got some things we’d like to talk about that some people come across in their own journeys. Like traveling, and how they eat out when you’re travelling, because you’re going to tell us about how you’re busy with your work and travelling around. We’re going to touch upon in this episode Methotrexate, Prednisone, Enbrel, Orencia, Humira, Rituxan, and the good old U.S. medical insurance, and how you’ve been through that washing machine with that. And Jackie is going to explain to us how she learnt so much through her experiences by researching and interviewing other people with this condition, which really gave her insights into I guess a lot of the deep struggles that people face. And how she went to the Mayo Clinic facilities in the U.S., a very very famous establishment as well as the Cleveland Clinic of Functional Medicine. You’ve done a lot of your own research, and you’ve had tremendous results with the Paddison Program, so I’m really looking forward to having this conversation with you. Jackie: Me too. So I’m really excited to share you know, as far as the research is concerned that’s just how I’m built. You know when I was diagnosed with this I didn’t want to accept it, I think most people feel the same way. So I was looking for answers to find a way around it unfortunately disease is going to be with me across my life, but I found a way to live with it and thanks to you. Clint: Well fantastic. Well I’ve given kind of an overview of of where we’re going to go with this. You’ve been able to share with me some of your results, just hit the audience with just 15 seconds like a TV commercial. This is where I was, and this is where I am now before we get any further. Jackie: First diagnosed in March of 2016, and I woke up one morning couldn’t even open a teabag, I couldn’t take my shoes, my hand were clinched, the pain. When we first set up this interview to do, I look back at my journals and I can’t even believe how bad it was when I read it because I’ve come so far. And I went through the process of going through a year of being on different medicines, switching around feeling miserable. And them a year of a changing diet after diet, to now almost 3 years since my diagnosis and feeling almost no symptoms of my rheumatoid arthritis. Clint: It’s fantastic, and you mentioned you’re down to just 5 mg of methotrexate but you’ve been on all those drugs I mentioned before except the prednisone and you didn’t quite get on a Orencia and humira will talk about how you’ve sidestepped those. But you’ve been on the biologics, you’ve been on Rituxan, and now you’re just on 5 mg methotrexate. It’s just fantastic results. Clint: So tell us, you mentioned 3 years ago is when you got the condition. Let’s just bullet point through your story, not that I don’t want it in a lot of detail but you’ve got so much else to share that I want to touch upon in this episode. So let’s work through your story in a sort of a bullet point fashion, give us the highlights and I’ll jump in if I can relate to some of it and share some further insights. Jackie: Okay great. So when I first came down with the symptom, I was misdiagnosed by my primary doctor after getting blood tests I requested. After what I read I felt that I’m headed for arthritis, requested a blood test, she came back and said I looked negative but when I print out the results myself it look pretty positive. So the difficult part is that I had was trying to get an appointment with rheumatologists. I needed a referral which I didn’t trust my primary doctor at that point. And when this happened this was probably in the first week of April, I couldn’t get my first appointment until September so we’re talking 5, 6 months. If you can imagine feeling that much pain and being(inaudible) hardly bear you want to do anything, I was really discouraged by that. So I kept trying, I ended up getting to a rheumatologist probably about a month later due to a friend who knew someone. And then I sat up 3 more right after that. So I sat up with 3 different rheumatologist that I thought I’m gonna go (inaudible) it’s gonna take me 6 months to get into. So I finally got the diagnosis probably 3 or 4 months after my symptoms, and that was probably the time was the most difficult because everybody wanted me to start or methotrexate, start with prednisone. And everything I read about it (inaudible). So eventually ended the 3rd day, Doctor told me, yes you have it. Let’s go ahead and start (inaudible), I started with methotrexate and you know about a month later I started with Enbrel and didn’t feel well from either of them. So it was almost about 8 months when I was on board with these drugs and nothing seems to be me working., but my doctor told me we have to keep you on this for 6 months because that’s what the insurance requires. So from that point. Clint: Sorry, I haven’t yet understood the world wide, country to country protocol for how the biologic drugs are qualified for. It does seem that in the U.S. it comes down to your insurance. It seems like if you’ve got insurance A then you can go straight from methotrexate to a biologic drug, but insurance B you may not be able to. Do you understand all this or is it? Jackie: It’s something that I always kind of been aware of and back my mind until experience yourself, you’re just like this is crazy. And you’re absolutely right because, no offense against my doctors but they were tripping over themselves to try to give (inaudible) if that does not work we’ll give you this other one. Oh you get this insurance bill approved, we have to play this game with it, it’s ridiculous. And then when you actually get the cost of all this I mean you know I’m fortunate I have very good insurance plan through my work but I know there’s a lot of people who don’t. And you know that they probably forgo those drugs because they can’t afford it. Here in America it’s something we talk about, it’s ridiculous and I don’t understand it. Clint: We’re all still learning, it seems very complicated. I know that in Australia you’ve got to be failing certain number of that conventional disease modifying drugs. So you might go methotrexate, then you might add a sulfasalazine or a plaquenil, and then if these things altogether fail then the government will subsidize and you can go on a biologic drug. So that’s the system here, you’ve got to fail, fail, fail, and so therefore you’re eligible because your symptoms are so bad. In the States, I witnessed this like your story with other people. They just go straight onto a biologic drug and I’m like, wow okay it must be, it must come down to the insurance level. But thank you for that. So you’ve gone on these 2 significant drugs in 8 months and you’re feeling rotten. What next? Jackie: So again back to insurance. You know my doctor seemed to think that Rituxan would be the drug for me which he said I needed to go on another biologic for the insurance to satisfy the insurance company because you need to fail to those before you can go to the Rituxan. So she was going to try to introduce, she tried to get the rituxan, and was going to try to go to Humira or Orencia. And somehow long behold I got a call from the hospital that said, hey we’re going to set up appointment for the infusion for rituxan. It’s it’s done by an infusion. You get it, and then 2 weeks later get another infusion any you’re good for six months supposidly. So that was a next step, and I jumped right from the enbrel to the rituxan. Clint: And stopped you stopped the enbrel completely, but you kept the methotrexate weekly tablets while you were going through this 6 month period, you were just basically on both. Jackie: Yeah, the methotrexate so they started me with 4 to see if my body could handle it, then it went to six tablets 20 mg and then up to 25 they wanted me to be on. And the first week I took that dosage, I knew I was a little foggy with even starting the Methotrexate but this one really put me over. I was in the middle of the conference call, I couldn’t vene finish the conference call. And I was just really confused and after a week of it I said no I can’t do this. And my doctor continuesd, try to push me because she really want me beyond on 10 tablets. And I just said no, I can’t function under that, so we kept it at 6 tablets a week. Clint: At 2.5 mg each? Clint: Okay. So, fast forward through the rituxan, 6 months. Did you ever get to the second round of infusions? Jackie: So it’s hard to actually explain if it’s the first or second because one round is a dose, you get an infusion and you go 2 weeks later. So I did that in January of 2017, and I was due to have the next infusion in June of 2017. So this time you know I’m feeling pretty good I went to the Mayo Clinic in between that, just want to see if they know. And after spending time with them they said I’m on right path, I figured they wouldn’t probably disrupt what my doctors doing, they said she’s doing a great job so continued on it. And this was in March of 2017. The rituxan, my understanding is it takes 6 to 8 weeks to start to feel you know does it make any difference in your body, to reduce the inflammation, so I started to feel relatively good at this point. And I’m right about that time in the first week of March of 2017 was when I found your program, so I also started with the diet right then. So needless to say I was feeling really good, March, April, May, June, and I went 4 months for the Paddison Program just cold turkey. When I found you in I was at my cottage in Michigan, I just liked every podcats I could, I was reading everything I could, I signed up for the program, and I went online (inaudible) for 4 days and did everything. Jackie: Yes so, July comes around, I’m supposedly getting my infusion the next round of rituxan in June, July. And I asked my doctor if I could put it off? Because I’m feeling great for at least a month. I had a couple of big trips planned I was going to the Virgin Islands, I was born in Napa Valley so I’m feeling good. So in feeling good you think you can start intriducing some more foods, have a little bit of wine, head a little bit of this and that. And come back for my vacation, I start to feel a little you know not so well, inflammations fells a little bit more. So I called my doctor, my doctor called in,she said oh you’ve gotten refused by your insurance company for the next round, they denied you. They said you don’t have cancer, and it’s a leukemia drug they said so they are further denying you, she said would appeal it. So I’m a little angry at this time because I’m not feeling so good and I’m thinking this is a drug that’s working. But I also did know well maybe it’s also the Paddison Program and the diet you know. Jackie: So after I vented through my frustration for about a month, I finally realized this is a blessing in disguise. Because now what I can do is the rituxan si out of my systems, my understanding is it last about six months, and so therefore now I go (inaudible). And so I was a little excited to do that, so right about August, September I went back to being really strict with the Paddison Program, sticking sticking with it, exercising, doing everything I need to do. So again 2 more denials from the insurance company on the rituxan, went back and my doctor in September, October. And she said you know we’re looking really great, considering that we’re not getting this, we’ll try to get the medication approved again. Late October maybe November I got a notice from my insurance company that they prove me but I didn’t say anything because I’m looking at my bloodwork which I’m getting 2 weeks at this time. The SED rate is looks great, the CRP looks great, so I’m thinking, I ain’t feeling any inflamation, so why change anything. I thought the doctor would call me, she never called. Jackie: So January of 2018 was my next visit with her, and she said Oh I see you get approved for the rituxan, let’s set up another infusion. I said, no, no, no, no, no, look at, and she said you do look pretty good. And at this time I’d and also been, since September I staredt to lower my methotrexate. I talked to her about it before, she didn’t recommend it but when I went in for this visit they said oh by the way I lowered my dose to 5 pills and she’s like okay, and I was feeling good. I did this slowly (inaudible). So, she said she agreed with me, let’s check back with you in April 2018. And she said we’ll see how you’re doing. I went back in April, everything again looked really good, Oh by the way I lowered myself to 4 pills of methotrexate. So were doing pretty good, I had a little bit about there. we had some a little bit stressed going on with my life. I took on a new puppy which wasn’t the best idea, but my head my heart don’t always balance. Then on top of that we were doing a reduction in workforce, so a little stress for the job (inaudible) jobs. So I started to feel a little bit of inflamation, and you know with that with a puppy I wasn’t taking care of myself. So she was a little concerned about that, and even though my blood work came back she started to introduce possibly put me on plaquenil which is a malaria drug to my understanding. So I said, wait a minute she said well it just will help you, blah blah blah, so she wanted to do some tests on that. At that time I met my 2 year mark and I was getting ready to go back and get my, actually it’s in my hands and my feet and my MRI to check it against the baseline. Jackie: So you know I’m very positive my doctors, I asked them gazillion questions. I’m probably one of the toughest patients but I said to her, so if my MRI comes back, my X-rays come back, my blood work looks fine, is there any reason to go ahead and start with the plaquenil? She said, no I don’t see a reason for it. Sure enough came back everything I got there on a diet and ended up giving the dog away. I realise I wasn’t the best for me, and went forward with getting back to business, and seeing my diet, and when I went back and saw her again in July everything looked great again. And by the way I told her, I’m lowering my methotrexate to 2 pills. So I pretty much carried that all the way through, been feeling great. In November, I went down to 2 pills, but I also realized the one part I was missing was the exercise. So the 3 components, that have been really life changing for me the diet, reducing stress, taking care of what only I can take care of making sure I do a lot of mindfulness meditation, and the exercise. The exercise when I came into this diagnosis I was as fit as I think anybody could be at my age, and I think that was the most difficult part was in all of a sudden I can’t do anything. So it took a year of really strong with different medications, and not feeling like doing the fatigue. And then I started feeling better there was one party then put right back into, it was kind of hard to get back into it. So I told I kinda made a pact to my self in November that I can allow myself to reduce my methotrexate anymore until I start doing yoga, Bikram Yoga five days a week, get back on it, so it’s the journey I’m on right now. So until I finish that 100 day plan actually, I won’t allow myself to reduce methotrexate anymore. Clint: Wow fantastic, I really enjoyed hearing that. The bikram yoga that you introduced. Did you notice a step wise reduction again in inflammation or any other physical improvements after getting into that? Jackie: Yes so I would like to say that I am a little bit more consistent than what I really am but I’m not. I think the most difficult part for me is finding consistency in this program is because of my travel schedule. So I felt like I was doing just here and there, in order to make up for that, like when I’m on the road I try to find a gym or location where I can go to a steam room or sauna. So I feel like I still get the same effect of getting the sweat the toxins out in helping my joints. But I haven’t been consistent with the bikram yoga, so I’m really looking forward to get to that point. I’m kind of researching areas that I go to on a regular basis, Chicago I’m always there. Looking at studios that I can actually become a member so I can drop in and do classes on a regular basis. So that’s the only thing I do know that it has helped me when I’m actually doing it, but I really need to find consistency so that’s what I’m working on right now. Clint: Is there anything else you do besides Yoga that is helpful for your joints physically.? Jackie: Yeah, I all kinds of work out program. I think that, I know some people have difficulty with doing weights and things, but that has helped me tremendously. I just feel that muscle mass, so I fluctuate between a weight program where it can building muscle and cardio every other day and just keep moving. The big difference here is that I find if I sit that I don’t feel like doing anything. So it’s always my mind, if you check around my house I have posted notes all over give you 45 minutes a day, keep moving, keep moving, you know. And that’s just a motivator for me, so just to do any kind of activity. There’s a lot of pride you have to swallow because I’m a very competitive athlete for many years. You have to realize you can’t do certain things you use (inaudible), so that’s a difficult thing. I used to ride, can’t really do that too much (inaudible). So I have to kind of lower that a little bit but I learned that, that’s okay. you know it kinda goes alomg my age. Clint: I can totally relate to that. I used to be a long distance runner, cross-country runner, and really enjoy that just absolutely love the feeling of the breeze in my face and just the exhilaration. Even not at a fast pace but just at a long distance run that you get when you’re running, and my knees are just too damaged to allow me to do that. On the left side I re-damage it this year only about 6, 7 months ago, I was getting up off the floor in my daughter’s room and I re injured the knee. And so, I’ve been working at the gym very very regularly, and bikram yoga back into it like the old days just to get the strength back around the glute muscles and the lower part of my quadriceps because I lost a little weight with the newborn baby just not able to and I’ve always been slim. And so for me I’ve always had to be active at keeping my my muscle mass. And so anyway losing a little weight around particularly the hips and the thighs, and then the knee become susceptible to injury because it has to take more weight because the muscle mass isn’t there to protect it. And I re-tweaked it and actually this afternoon I’m going to have to have my MRI which I had done recently evaluated, and just see what the knee is like because it’s been about eight years since my last MRI on that knee. So I can totally relate to it, and I watch people running from our balcony because there’s a bike path outside our balcony here at the house, and I say to Melissa I just want to be able to run like that guy. Clint: So, we we all have those sorts of feelings of disappointment but there are other things that we can do to substitute those. And I’m so glad you talked about creating a muscle mass, and I just think it’s so important to build muscle. When we feel strong, it’s an antidote for the emotions that come with the joints pain and so forth. Jackie: The important thing with that to Clint is, I didn’t realize how much Ive lost too. I kinda when you lose the weight you don’t feel like eating anything because you feel terrible. So you start to lose weight, you look thin and frail. But then even when I started to gain weight back I realize the muscle that I lost. And now that I’m back in this work out program and started, you can see a difference just in staying with something for 2 or 3weeks. I can’t believe how much you forget when you’re in she forget how much shape you’re into or out of shape but you feel so much better. So if you can just do a little bit I mean I was have 10 pound weights, 5 pound weight sitting right there. If I’m going to watch something on Netflix. I’m going to be doing this while I’m watching TV or a sporting event. Watching the games on TV, I’m right there and just knock out the rope. Clint: Completely agree. Last night were watching the end of a Netflix documentary and I’m doing the pranayama breathing exercise right in front of the T.V., the very first thing in bikram. So if I’m not doing that I’m on the floor and I’m stretching, I’m doing some hip opening exercises or some some silly wide stretch from my inner thighs. I mean yeah I’m on the same so I think. Jackie: I can relate to that. Jackie: (inaudible) my sisters laugh at this but if I can give a tip to the viewers. You know we all brush our teeth every morning and every night I have an electric toothbrush and it’s set for two minutes. In two minutes I can knock a 120 squats, you can do so many bands if you think about. And if you’re doing this for 2 minutes in the morning, and two minutes in the evening, think of a different you can make this thing in 2 weeks. Clint: 102 squats is incredible. Jackie: You can do that it’s evrytjing. For 2 minutes you’re gonna sit thereand just different things so I always try to mix it up. Clint: Do you go down to chair level or is it sort of a semi squat? I find this really interesting. Jackie: I do chair level and I do shoulder leg but a little wider and little bit wider. Clint: Oh, so that your knees get knees and feet get further apart each time. Yeah. Have you ever found with your knee any kind of position with the squat that irritates the knees? Like how do you squat to ensure your knee feels good? Jackie: Yeah sometimes it’s you know gets tweaked a little bit. I’m an old soccer player so I tore the ACL (inaudible). Clint: Me too, I tore my ACL. Jackie: That’s a first area that gets attacked when I have a flare up. Clint: 100% that’s what happened to me too. Jackie: So I find that the twisting, I just have to be careful from the twisting motion and especially if I do those flats where your knees kind ofhave that angle that’s a little more difficult. (inaudible) or something that I used to be able to do fairly easily but you know as you start to lose the muscles around that knee, you don’t want to put to much strain on it. So sometimes when you do lunges that’a little harder, and what I do sometimes it’s just (inaudible) hands on your thighs so there’s not so much pressure on that knee to bring you back up. Building around it and it’s even just fill in the hamstrings and do quads, you can sit on the floor and you can you know from old knee injuries you can do quad sets. And again, 2 or 3 weeks of doing those (inaudible) for 5 or 10 seconds, it’s amazing the muscle you can build up in your quad just by sitting down. I do it in a car, I drive a lot sometime I drive 4 or 5 hours in a car and if I’m sitting on a stop light or something, I’ll flex my muscles and my quads and try to strengthen that. Clint: I See, so you’re not actually you might only raise off the seat maybe only a quarter of an inch but it’s just the engagement, and pushing down through the heels. That gives it the squeeze. Clint: I love it, Okay yeah fun. I’m going to knock out 100 while we chat here, Fantastic. These are really good tips. 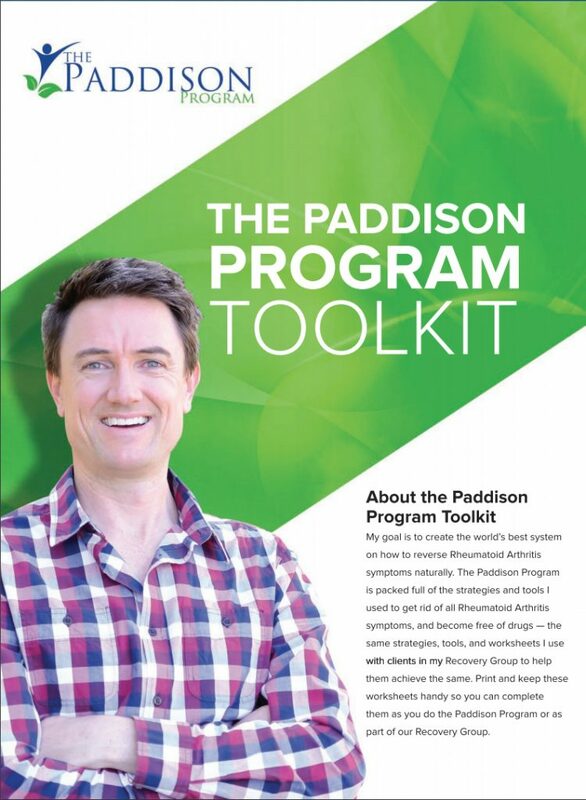 Tell us, if you are now speaking to someone who knows nothing about the Paddison Program but they have the materials and they’ve read it, what would be the things you would say make sure you emphasize or look out for? Jackie: Well you know, I found it pretty easy for me to go into the fasting, you know that’s kinda maybe a little unusual. But a lot of people are so afraid of that, and I would say then go in to (inaudible) some broth or do a liquid ywhere you get a little bit of something if you’re if you’re concerned about that or just do it for the amount of time you can do it. You don’t have to do it for two or three days you know. I feel the best way to do it is you don’t (inaudible), but that’s just me. You know I think a lot of times we think too much about things, and I’m going to start my diet on Monday. I always say, why not start today enough. So if you can just jumped right in to it, that’s the only way you’;re really gonna know. I don’t think there’s anything to be afraid of, everyone’s different you know. So what I experienced with it, and I followed your program, I found successful. But then after I went back a little bit, I found that maybe the chemo wasn’t so great for me. I was just so excited to have some food after doing the juicing and the fasting I was like, oh this is great. But you have to really tweak it, and it takes a lot of coming back to it. So the only way you can really find success in it is by starting it, and start in get it under way and get going. Jackie: The elimination diet it is difficult, but I find that I do resets every so often because once you start feeling good it’s easier to say oh I can have that or I can do this. We don’t want to give up the things we love, so we do I’d love wine and I like to go back to it. But I also know the consequences of what’s going to be, I find that I can tolerate those things now because I don’t do too much of it and I don’t string it together. And so it’s really rewarding once you find that you can control your symptoms with your food. And finding your program gave me hope when I was at a point where I thought, wow this is the way it’s going to be. I really went to a dark place you know. One of the first things I did you know started it kind get sidetracked here, but when I first got diagnosed I was always the who was trying to figure out the answer, I’m going to find a solution for this. Jackie: So I started to contact people that had it. The first person that came to my mind was a college friend who we have just reconnected. And now you look back, there’s a reason why we reconnected, but I just moved back to St. Louise from Chicago. And I remember in the back of my mind for saying that one time we were at breakfast but I never really you know shame on me didn’t pay attention to really what it was. So I called her first and she said to me, I’ll never forget that she said, I pray my friend that you do not have this because it’s a devastating disease, I struggled with it for over 15 years, and I hope you don’t have it. So from that moment on I started contacting other people who had it. My questions were, how long did you have it? What were your symptoms? What are the medication your on? Who’s your doctor? What’s the side effects? And the damage is, if you had any. And I think the most discouraging thing for me which I’m sure a lot of your viewers are finding, is that no one seem to get better. And that was so discouraging because everybody was changing medications sure the drug made him feel good for a while. They were calling it miracle drugs, and some circumstances people tell this one was great and then after 4 or 5 years, I couldn’t handle it. Jackie: And it wasn’t good enough for me you know., and I went to a dark place where I was so depressed because I thought wow everybody’s on this medication you keep changing and this is always going to have to be. Until I found your program and started reading more about diet, and when I looked at stories on your podcast (inaudible). The methotrexate side effects are in my head, somebody is really experiencing this, I knew that I wanted to try to get on that. And then I saw hope that people really get off their medication, there was something to shoot for, and it was a changing point for me, it turned everything around. So to the viewers out there that are struggling, I think you can find really some relief through changing your food, finding out what’s triggering the inflammation in your body. There is hope. Clint: Yeah. That’s great. Wow that’s really cool. You talk about the example of finding the sort of inspiration by watching other people come off their medications, and think you know yourself I can do that. When I was on Methotrexate I had only been successful in getting it from 25 mg down to 15 mg, and finding it still difficult to try get consistent month to month very low C reactive protein levels so that I could lower it further. And I had no role model at the time, there was no someone that I could watch to see that they had been able to achieve this and that therefore it was possible. But I just had belief that it had to be possible because when I stopped eating I felt great, and so I thought there’s just a digestive issue and absolutely has to be able to be fixed and that’s all I had in my mind. Clint: But for me just to recall what happened, I was in the United States and I had my methotrexate with me and then completely innocently without any kind of intention. We left my methotrexate by accident at my mother in law’s house when we returned to Australia, and it took a week when I got back to Australia to realize that I didn’t have it. Then we contacted her and it took over two and a half weeks for it to get sent from the United States to Australia, and then I hadn’t taken it for 3 weeks or even a little more. And I looked at it and I thought it’s been three weeks since I’ve taken it and nothing feels different. And I thought if I can get through another 3 weeks, I might be off this thing and obviously this is not what I recommend anyone does. but I’m telling you. At the end of like 2, 3 months passed after that, I didn’t notice a single difference, not one single difference in my body. As though the drug stopped working a long time ago and I was taking this medication at 15 mg a week which is mid-range. And I don’t know how long I would have been on that drug if I had not have accidentally left it in the States and then kind of became a little rebellious on top of that, I don’t know. But anyway, look now we have other conventional way people who’ve done conventional methods of coming down off these medications, and that is inspiring. And that definitely creates that hope that you talk about. Clint: Let’s move on to your experiences with Mayo Cleveland Clinic. What’s happening here at these world class facilities with their belief on how to treat these conditions? Jackie: Well you know I put in about 3 or 4 months after my diagnosis and you know the frustration of getting in to a rheumatologist here in the States. I started to do research and looked in Chicago, trying to look for the best rheumatologist I could. And when I looked at these hospitals, traditionally John Hopkins comes out and the Mayo Clinic has some of the best rheumatologist hospitals in the country. So I put in for an appointment, it took about 6, 7 months for me to get in. And I was excited about it, I don’t know what I expected out of it. A breakthrough, miraculous thing (inaudible). I really also wanted to know, I want to get as many great minds in this field to tell me what they know about it, so I can kind of make my own decisions or how to move forward. Well the one thing that was kind of surprising, I spent a great amount of time in the Rochester Mayo Clinic. They’re really thorough with 3 hours, went over all my records, checked everything. Yeah (inaudible) good, real comfortable setting, they answer every questions and don’t feel rush. And the one thing I really want to ask more about was nutrition, because I’m kind of one step down certain to learn about it. I have (inaudible) Heliox disease and she was really helpful in helping me to (inaudible) you know I started gluten free and then I did paleo, I did all this stuff to try to find the right thing work for me. Jackie: So I was asking about nutrition I think what surprised me is that, I expected it from my answers from the doctors that I have here but I didn’t expected Mayo Clinic remember say well we really don’t have anything on it. We just can’t encourage you there because there’s not enough evidence, so we can’t send you down that path. So basically they handed me a brochure on meeting with a dietician. Yes, I was kind a surprised about that. But I can understand it as I started to realize, these doctors they get maybe four hours a nutritional study and they were really there for medicine. And so I did it, but it’s interesting how now I can kind a (inaudible) 3 years since I’ve had the diagnosis. Even my doctor who started to really change her thinking, before she was like no, I can’t you know. And I get a lot of people when you start on a nutritious path to try to get themselves better, most people can’t stick to it you know. And I found it difficult for me, I’m single with no kids, no family. So it seems to be easy for me to be able to make those decisions when it comes to dinner time what I going to eat, I know a lot of people struggle with that. Jackie: So actually most people don’t stay with us so therefore it’s very hard for them to get you know true you know information and something that really works. So in the Cleveland Clinic, I went to Cleveland Clinic of Functional Medicine and that’s completely different. They’re really all about looking at the foods, doing the elimination diet. That was also, you know thanks you again and the information that I found on healing the gut by the time I got to the Cleveland Clinic which was October this past year even the nutritionist and a dietician were saying, this is the stuff you have and you’re doing really great. And I actually spoke to some of the people in the room that just said hey this is (inaudible), and this is where I’ve been and you’re doing the right thing of trying to figure it out. So I think I was inspirational to some of the people that were there that it just started to have problems with their gut and not knowing what’s going on out there body. Jackie: Yeah but really the Cleveland Clinic was really great, and again spending 2 or 3 hours with the doctor, meeting with health coach, meeting with the nutritionist, and really going through the whole process of elimination diets so you can figure out what the triggers are. Clint: So you pretty much just booked an appointment as you would to your local doctor, and you said Hey I’m from out of town I’m just coming and I’d like to have an appointment. And you kind of select the specialists that you’d like to talk to. Is that kind of what you did? Jackie: What would they do with this initial meeting is you meet with the doctor one on one for a couple hours and they go. I mean it took me about 6 hours to fill up paperwork, because they go from everything from when you were born, how you were born? What kind of formula? And my mom passed when I was 12, fortunately I had sisters to rely on saying, do you remember what kind of formula was I breast fed?. My sisters remember that which was amazing. So you know some of the things you go through, any traumas in your life and you go through every little thing, when you had your first ear infection. You know that’s another thing not to get sidetracked but when you talk about the antibiotics, you know trying to figure out what causes disease. With my parents both deceased, we really didn’t find any history of rheumatoid arthritis that we know of. Like I always had ear infections in strep throat, and constantly just antibiotics my whole life. And then when low and behold being an athlete that I am when Advil was introduced, we were popping those after soccer games and play football games. And just because you know, oh this is a pain reliever. Now that I look back on all that, I think that’s what really can cause some hattrick to my gut. Clint: Yeah, I think really there is a potential for anyone just basically on a Western diet to develop this condition just because it’s so high fat so inflammatory. Just that alone makes it possible to develop this condition. And then when we go and stir the fire by adding antibiotics, and painkillers each month, and other medications which you know they are endless of all different types of anything from any depressant drugs to blood pressure drugs these are all toxic for the body. And then you add the enormous amount of stress, and then a lifestyle that doesn’t in most people’s cases not yours has very little exercise. You’ve got a perfect storm, and this is why autoimmune diseases just are out of control right now as because all this happening. And yeah, but of all I think antibiotics is the biggest culprit of all. Jackie: You know it really thought, a lot of my friends even said as my family said that when I was diagnosed you know which you eat really well, I thought I ate fairly healthy. I was eating Sillito time, a lot of chicken, and lean meat turkey. But when I look at the chickens and all the antibiotics that I had wanted to see these you know these plump breasts and stuff that change my thinking. Salad dressings, when you look at really what’s in those. You can go wow, I really wasn’t eating as well as I thought I would. Clint: Salad dressings are just inflammatory omega 6’s that’s all they are. Even if they’re heavily skewed towards olive oil any other form of oil is going to be very heavily inflammatory. And I know once you’ve got an autoimmune condition, olive oil will just light you up as well. So like there’s yeah, and all those chicken unless especially in the United States I mean you know it’s an antibiotic house. Tell us travel tips, travel tips you get around for your work. How do you stay on track, and do you pack food to take with you or would you research restaurants to go to when you get there? Give us some tips on that. Jackie: Well that was probably one of the most difficult things when I first was diagnosed, and I found myself not eating which is even worse. I’d go to places where there are functions for work where they cater in food and I would just stay away. But even just this past here I cannot believe the changes that I see in restaurants, and in grocery store, is that people are becoming more aware of gluten free, dairy free, soy free, and it’s great. You know it’s a great time to be diagnosed with this disease (inaudible) sounds right to say that. But what I found is, I just wanted to adapt to it. So I actually when I travel to an area, I’ll find a whole foods which is (inaudible) in the states, I don’t if you have them there or grocery store that has organic fruits, vegetables, things like that. I will buy a bunch of those things, make sure that my room that I’m staying, my hotel has a refrigerator or freezer. I often carry my blender with me for my smoothies because it’s easier that way. And I bought one of this great yeti, hand held carries that I can take on a plane. I can take in a car that holds ice for a long period of time. So I’ve got it down to science, one thing I always keep on hand is fresh fruits, some good protein bars in case I need something to go to. I make a lot of salads ahead of time, pack them up. Jackie: One thing I found that if I’m forced to go which I am a lot of time to business center. You can always find salad or some steamed vegetables that you can get, you just get to learn to carry your own dressing. I think at first I think the most difficult part is, we’re built in our society to really go out to eat as a social thing. And I kind of felt really left out in that atmosphere because you feel bad because you don’t eat, and I think when I found there was not really me that feels uncomfortable it’s the other people. Clint: That’s true, that’s so true. Jackie: (inaudible) no I’m fine, I’ll just get a glass of tea or something and they’re all are you sure. I do want to be a burden but I was absolutely fine with it everybody else feels uncomfortable. Clint: So insightful, I’ve noticed that as well. And I have sort of forgotten the degree though that people do get uncomfortable when you choose not to eat or you choose not to eat what they’re eating. Why not, what’s wrong with this? Jackie: Or they feel bad for you, no I’m fine really you know really. But I’ve really learned to make that work, and a lot of it comes to planning ahead. And knowing, I go to a lot of the same areas frequent no restaurants. And I find myself not just not eating out anymore because it’s just easier to do. if I’m going to meet people for a meal, I eat beforehand and it’s just a lot easier, and I’m okay with that. Clint: And they don’t mind that explanation as much. If people say how can you not eat anything you just say. I literally just hate before I come here I couldn’t eat another thing I’m stuffed. They’re like, oh okay. And it really does soften the blow to them a lot more doesn’t it? Jackie: I’m also taking my own food with me in the restaurant. If I’m with a group of people I don’t feel so bad, and i tipped the waiter well but I say hey on special diet so I’m taking it with me. Clint: And the US restaurants are really good at mixing and matching stuff too. So one thing that ocean Robin said on a recent podcast because he’s got his recent book that he’s just released. He said you can go and you can order like, you can look at the menu, and you can go down the menu. You can see all the foods that are on the menu, and you can think Okay I know that there is for example like some carrots in there, there are some zucchini in there. There might be some rice in that dish, there’s some black beans in this other thing that I otherwise can’t eat but I know there’s black beans in there. So you know that back in the kitchen they have these ingredients, and you can put together your own little combination. Jackie: Yeah the key with that is I found in a lot of the chain restaurants in the United States, that ordering steamed broccoli is not as easy as it would seem to be. Because they have a preseason and shipped home that way. So I actually had a discussion with the manager, can you just steam me some broccoli and they go, it’s already seasoned it’s got the butter, it’s got everything (inaudible). Clint: Food production, it’s scary when you look behind the scenes isn’t it? Jackie: Yeah. For me that wouldn’t really affect me that much from somebody with (inaudible), that would be devastating. Clint: Well we’ve been through all of the bullet points that I’ve got here on my piece of paper that I wanted to cover with you. Any other messages that you’d like to put out? While you got a chance to speak to so many people who are maybe struggling or you know hitting roadblocks with this condition. Jackie: Yeah I think the one thing you know the word hope. This program, finding out that you can actually control your symptoms I should say, I can control my symptoms. With the food that I eat, has been life changing for me. And it has given me hope. When I went through that first year I really went to some dark places, thinking oh gosh is this how it’s going to be for the rest of my life? And it was discouraging, when you get to a point or feeling like what’s the point because my making go hiking, if I can’t do this or that. There’s hope there, there’s hope and I am actually you know my goal is to off this medication by the summertime which I do not think is unrealistic for myself. And I hopefully believe that there’s people out there that can find the same path. It’s just a matter if you choose to do it or not. You know I have a lot of people who have come back to me and say wow what are you doing? You know they’ve had it for 10, 15 years. And once I tell them, well you know I eliminated gluten, I eliminated dairy, I eliminated soy. They go, oh I can’t give up my cheese. Jackie: And so some people just don’t have it in them to do it, and they’re just happy with taking the medicine and just thinking that that’s going to bridge the effect and make it work from. You know that’s a personal choice. If you really are discouraged or out right now, my recommendation would say just go all in and try you’ve got nothing to lose. I really looked for the research, I researched different books and read the auto immune fix, (inaudible), some of the ones you suggested. Research everything you can, and find the common thing that I see is that diet has helped a lot of people on this journey. You know Dr. Terry Real’s, there’s something to this. And so if you can take look at it, start with the elimination program such as Paddison Program, and go all in. There’s hope, and I really think you can find your answers and get off the medication coz it’s not doing your body any good. Clint: It’s a blessing that you bypass the prednisone and that was an insight that you had. We didn’t talk about much on your journey, but as far as we can sort, we can suffice just to say that it was offered then you declined that right? Jackie: Yeah I saw some ill effects with my father in prednisone, and I didn’t like what I’ve heard about it. So my doctor kept trying to say, hey it’s just going to bridge the gap and make you feel better. Clint: I hate that bridge, I hate that bridge, we shouldn’t use that bridge. (inaudible) exactly like that bridge becomes a highway to hell. Jackie: Yeah I said no and there’s often times I looked at the prescription and looked at it but I wouldn’t do it and now I look back and I’ve actually heard stories of people who have said and I think the couple in your podcast it said, they wish they had stayed on it so long, it damaged them so much. You know I understand there is a need for steroids to a certain extent. In fact when you take Rituxan it’s administered with the steroid like 50 mg no 125 milligrams. Jackie: And I was really upset with my doctors, i found out after the fact and she said they do this because (inaudible) some fatalities with the Rituxan it’s highly toxic, they just do it for precaution. So I had to ask her on my next infusion if I can cut in half because I wasn’t happy with it but she was telling me that she felt better with it because of the safety of it, you had to administer it with it. But that’s the only time I think I took steroids, and I think I felt that I was forced into that. But knock on wood hopefully I wouldn’t have that moving forward. Clint: Yeah that was a long time ago now too so that stuff is well and truly out of the system. Just as a note for people watching this, the prednisone administered through an injection is just as bad for leaky gut as what it is when you take a tablet form. There’s no way out, there’s no way out, it’s going to cause very very bad long term negative effects on the digestive wall. Clint: Anyway so well done. Absolutely wonderful, and good luck with that with your methotrexate goals. You’ve got it to a point now 5 mg, I’ve heard doctors say that it’s such an insignificant dose. In fact I forget the medical term, it’s not ineffective dose they’ve used that for referring to 5 mg Methotrexate but almost a nonclinical dose or something I mean you’re right down there at the moment. Jackie: Yeah, I guess when you think about it, they started me on 4 to see if I can handle it. So it seem insignificant, I haven’t seen any change in my SED and my CRP levels everything’s fine, really good. So I just feel like if I could just do it slowly you know 3 or 4 (inaudible) at a time. Again I’m holding myself to on this until I get my exercise regimen. Jackie: (inaudible) So I really feel I’ll be medication free in a few months. Jackie: It’s a journey that I couldn’t done have not found you. So thank you Clint, thank you so much. Clint: Well thank you very much for all the hard, work and you know it’s the situation where you have the information. But unless you go all in as you put it, you’re not going to get the results. So congratulations, and I really appreciate you sharing your story and your insights. We’ve learned a lot from you. Thank you, Jackie. Thank you Clint and Jackie. After Paddison Program i have progressed a lot too. Last week i introduced myself a sluce of sourdough bread with no reaction. My on concern is my right knee which makes wired noises when i do bikram yoga, as if it is going to snap.